I just finished this tiny hanging ornament for my dear niece. For gift-giving I popped it into a small premade paper-covered box from the crafts store, which I enhanced with an added scrapbook sticker that says “forever joyful” – which is how I think of her. 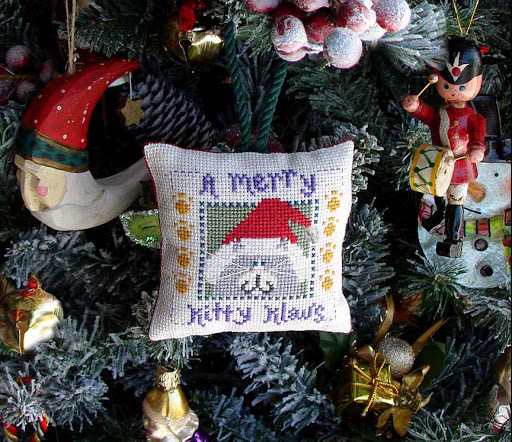 I finished the kitty ornament last evening as a stuffed pillow hanging, backed with a piece of dark red printed cotton and using some silky green cording for the hanging loop. And made a tiny white pom pom out of floss for the hat. 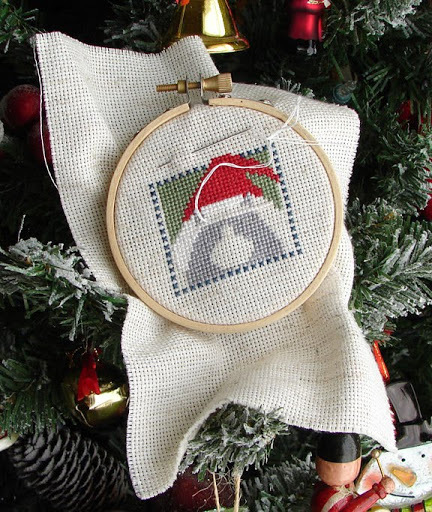 I’m only a little bit farther along on the “Merry Kitty Klaus” ornament. Real life job has kept me busier this week, and earning dollars outweighs stitching for pleasure every time! One good thing, since this ornament is being given in person I don’t have to worry about finishing and mailing it early. The pattern calls for Wisper floss (a fuzzy blend of mohair and nylon thread) for the “fur” on the Santa hat – which is actually something I’d never heard of before this chart! – but I am skipping that bit. 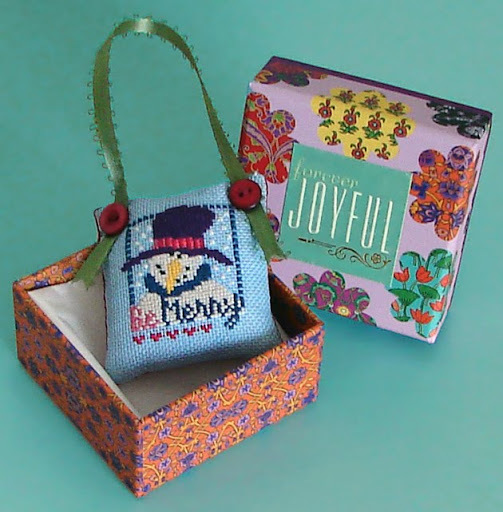 It is possible that I have a tiny jingle bell somewhere in my sewing basket for the tip of the hat, and, if not, I will use a homemade pom pom instead – if I have time to make one!